Let’s face it. Furnaces and air conditioners do not keep regular business hours. That’s why you need an expert who is available whenever they break down. We offer 24 hour emergency HVAC repair service to help fix the problem fast. From new construction or historic buildings, to residential or commercial structures…we do it all. We can help you select the right unit for your needs and professionally install it for you, so you can stay warm in the winter and cool in the summer. Regular maintenance can help keep your HVAC systems working at peak efficiency and prevent unexpected problems. Our maintenance and inspection services will help keep your equipment running smoothly for years to come. When your heating or cooling system breaks down, you want a service professional you can trust. We take pride in providing excellent service and support. We are your Northern Michigan hometown comfort experts. Since 2003, Michigan Heating & Cooling of Petoskey has been providing local residents and Northern Michigan businesses with the HVAC equipment and services they need to stay comfortable year-round. 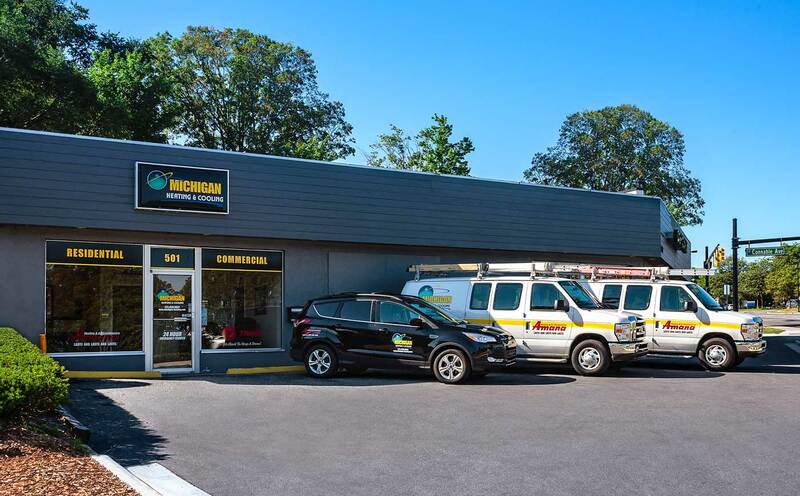 Our 34 years of industry experience and dedication to customer service means that you’ll get exactly the right equipment for your needs, and the professional service to make sure it is installed, maintained, and repaired correctly. Our experience includes new construction, historic homes and buildings, residential structures and commercial buildings. No matter what your heating and cooling needs are, we have the skill to make sure you stay warm during the Northern Michigan winters, and comfortably cool in the summertime. We’re not just located in Petoskey, we live here too! We created Michigan Heating & Cooling to provide residents of Northern Michigan and local businesses with reliable, professional HVAC services that are second to none. Our service area covers Emmet and Charlevoix counties, and parts of Antrim, Otsego and Cheboygan counties as well. We cover from the Mackinac Bridge to Gaylord, Petoskey to Indian River: Alanson, Brutus, Harbor Springs, Pellston, Boyne City, Charlevoix, East Jordan and more. We’re your hometown comfort specialists!